I created a pattern for these 3" x 3" purses back in the fall, and thought it would be fun to make one in summer colors. A girl needs a new purse for each season, right! The purse was created using the Faux Tile and Faux Stitching (both past TJNL Techniques). On the front panels I used Basic Grey Perhaps paper and the new Soft Suede card stock from Stampin' Up! as my base card and foundation for my purse. I found some pink embossing powder in my stash that matched the pinks in the DSP for my faux grout. Just a few tips....When doing the drywall stitching, remove most of the tackiness from the tape, this way when you remove it from your card stock, it won't lift up any fibers when removing. Using a ruler helps keep your stitch lines straight. If you don't own a Xyron, Stampers Magic Tape works great under your DSP, and you and just sprinkle on your embossing powder and heat. 2-3/4" x 2-3/4" added a piece of Soft Suede Polka Dot Grosgrain (this ribbon is reversible), then adhered to my 3" x 3" Soft Suede base card. 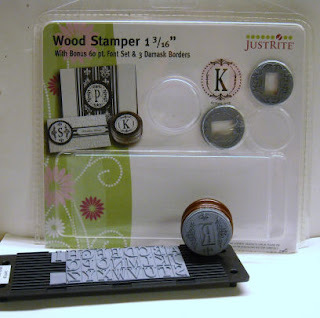 The monogram was created with the new 1-3/16" Wood Stamper with 3 Bonus Damasks Centers & 60 point Font from JustRite, that will be released in July. 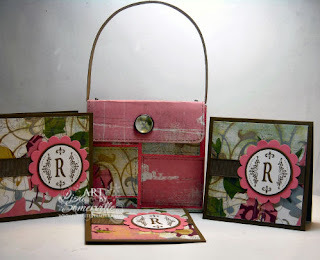 This size works perfectly with Stampin' Up! 's punches! Here I stamped the Damask and Alpha in Soft Suede on White card stock, punched with the 1-1/4" Circle Punch, layered on a 1-3/8" Soft Suede Circle, then onto a Regal Rose Scallop. For the flap, I punched a piece of Perhaps DSP with the 1/4" Circle Punch, and adhered it to the Build a Brad. To hold the purse flap closed, I used Basic Grey Magnetic Snaps. Lisa it's always a delight to see your work, it's also very inspiring. Fantastic purse and cards!!! Love that paper you used! Terrific any time, doesn't need a season, just a new "bag"! Wow, Lisa!! These are just so wonderful! Love your little purse!! Oh my gosh, this set is SO cute!